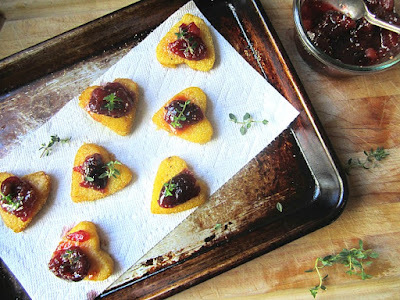 What to do with yesterday's leftover polenta? The polenta from yesterday's recipe will firm up once refrigerated, so scoop it out of the pot and spread out on a cookie sheet. Place in the fridge and cover. 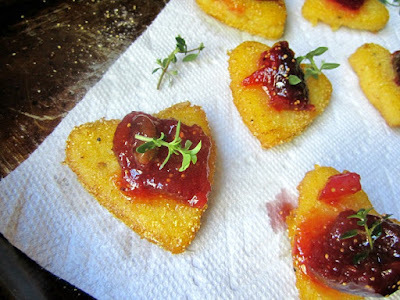 Of course you can make a fresh batch of polenta for these lovelies. 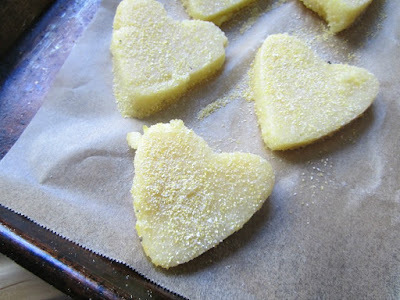 Once the polenta is firm, cut into heart shapes with a cookie cutter. It's important to coat the hearts on both sides with ground cornmeal so they get a nice crispy exterior. Place some butter and olive oil in a nonstick skillet and gently fry the hearts for about 2 minutes on each side until golden. Blot on paper towels and dot with fig jam or any flavor jam you like (bacon jam is extra good on these). Best served warm, but also delicious at room temperature. My late Mother would be amused that what she knew as “corn meal mush” became polenta. She would put it into a loaf pan to firm up. Then slice it and fry it. Served with maple syrup as a breakfast item. You know, I just realized, my dad used to make "mamaliga" a Romanian cornmeal mush.....I never knew the origins, until I just looked it up now! I am a 3rd generation American, however, my great grandparents were of Romanian descent, and my dad grew up with this mush. I hated it as a kid, but my dad loved it with maple syrup!!!! My mother's side settled in Franklin County, Virginia in the 1780s and learned much about corn...some would say they could turn it into a liquid product for personal enjoyment and a few dollars. Also, the corn meal dusting here total makes this recipe. Stacey, my Mother was from Western Pennsylvania. Her Mother fed a family of 13 everyday, three full meals (the largest at noon as My Grandfather brought his business clients home for lunch. And then there were the hobos who found their way from the train tracks to the sweetest lady and best cook in town. Needles to say, cornmeal mush had to be a big help to the budget and the cook! After the family moved to SoCal, Mother transferred her love for cornmeal things to tamales. She adored them! Fixed one for herself (store-bought) as the rest of us were not so excited about them. PS. That one tamale she fixed for herself was at lunchtime!